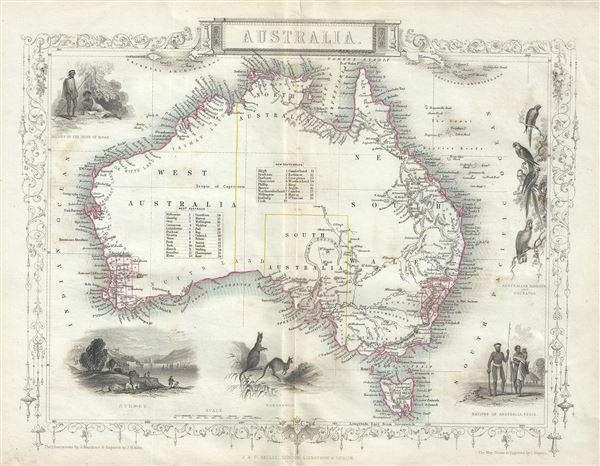 This is a beautiful 1851 example of John Tallis and John Rapkin's 1851 map of Australia. It covers the entire continent of Australia along with Tasmania or as it was known at the time, Van Diemen's Island. An interesting map issued just as most of the earth's non-polar shore has been explored. Gone are many of the errors of the previous century with the coastlines accurately rendered. Inland though, much remained unexplored. Vast stretches of unmapped territory and speculative cartography fill central Australia. The early colonies in Western Australia and New South Wales are noted. In 1851, though not noted on this map, Victoria would become an independent colony separate from New South Wales. This map is engraved by J. B. Allen and includes illustrations by J. Marchant of Sydney, Natives of the tribe of Bogan, Natives of Australia Felix, Australian Parrots and Cockatoo and Kangaroos. The whole has the highly decorative presentation and elaborate border distinctive of Tallis maps. This map was issued as part of the 1851 edition of John Tallis and Company's The Illustrated Atlas, And Modern History of the World. Rumsey 0466.051. Phillips (Atlases) 804.